The Jays are better than the Red Sox and will win more games in 2006. Yes, I'm keeping a list. The Manny Ramirez/Miguel Tejada trade rumours have returned in the last two days -- with a bizarre twist. Boston has tossed Matt Clement into the deal, too. It sounds loopy -- there's been no official confirmation -- but that's what the Baltimore Sun and Boston Globe are reporting. And after saying he wanted to be traded, then saying he didn't say he wanted to be traded, Tejada is once again saying he wants to be traded. "Now, I am more upset than when I requested the trade because it's been a month and they haven't done anything," Tejada said yesterday. "[L]ook at Toronto, they have strengthened themselves and we haven't done anything. ... If the Orioles don't do anything, I want them to trade me because I am tired of losing. ... Next year, I want to be somewhere where they want to win." 1. Baltimore's ownership and management is largely opposed to dealing Tejada within the AL East; 2. Ramirez and Clement are owed approximately $22 million more in guaranteed money than Tejada. (Ramirez is due $57 million over three seasons, Clement $19.25 million over two seasons, and Tejada $48 million over four seasons plus $6 million owed on a prorated signing bonus); 3. Ramirez, who can veto any deal, would have to approve a move to Baltimore. And Reason #4, courtesy of me, is: It's too much talent and a desperation deal for the Red Sox, who are not desperate. Also, the Gotham Baseball website, quoting "multiple independent baseball sources," reported that a megadeal between the Red Sox, Orioles, Devil Rays and Mets was in the works that would, as far as Boston was concerned, mean a straight Ramirez-for-Tejada swap. Peter Gammons says that the Cubs, Phillies, White Sox and Astros are also interested in Tejada. ... However, according to an Orioles official: "There is absolutely no deal we find acceptable to trade this very special player to another team." Out west, the Seattle Times reports the Mariners have offered pitcher Gil Meche and center fielder Jeremy Reed for either Jonathan Papelbon or Jon Lester. An NL Scout: "Every team who has talked to the Sox about a deal has asked for one of them." J.T. Snow hopes to sign with one of four teams, including Boston, before the new year. He would have been a nice pickup for Boston for 3/25, tops. I assume the Sox were not even close to matching the Rangers' generous offer. Things are not in disarray. The ship is not rudderless. The Boston Red Sox organization has a plan -- and it is a good one. Gordon Edes gets it: the Damon negotiations unfolded without Theo Epstein pretty much how they would have unfolded with Theo. Epstein dropped plenty of hints during the summer when he said he wasn't married to the idea of making the Sox the best run-producing machine possible at the expense of pitching and defense. That was the best approach with what he had to work with, Epstein said, but under different circumstances, he might take a different tack. That may be what we're seeing at play now, the team switching to building a deep bullpen, investing heavily in starting pitching to complement the wave of young arms coming up through the system, and upgrading defensively even if it means sacrificing some offense. Edes also thinks that "sometime in the next month Epstein's 'adviser' role will be made official". Feel free to email me with anything outlandish you see or hear -- that includes negative Red Sox predictions, too (with a link, if possible). Kevin Millwood was in Boston yesterday, meeting with Terry Francona and other Sox officals. An industry soucre says the Red Sox have already made an offer of four years, but Millwood is looking for six years at more than $11 million per (which is what AJ Burnett got from the overpaying Blue Jays). 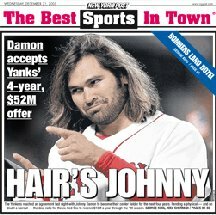 In his New York interviews, Johnny Damon mentioned several times that there was some other team that had offered him a six-year deal and John Henry said Scott Boras mentioned a firm 5/65 offer, but no hints have been offered as to the identify of the mystery team(s). 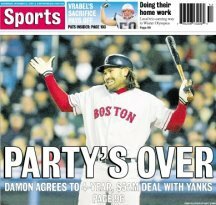 ... Johnny Damon says that Manny Ramirez urged him to sign with the Yankees. Yawn. The CF rumors continue: Coco Crisp, Corey Patterson, Joey Gathright, etc. It looks like Troy Glaus will end up in Toronto (whew!). The Sox inked catcher John Flaherty and are one of three teams still pursuing 37-year-old JT Snow. Mark it down: It's going to be another Babe Ruth. They sent Johnny off just like they sent off Babe Ruth. It's going to be another big, big mistake. They made the biggest mistake of their lives. Wow. What do you say to such astounding ignorance? If you're me, you laugh until your sides ache. So Damon is going to perform like Ruth (who was sold, and was not a free agent, by the way) did in 1920 and 1921? ... I promise to live out the rest of my days as Mr. Damon's slave if that happens. The Yanks very well may become a 1,000-run team in 2006. The Yankees scored 886 runs in 2005. Their various center fielders scored 68 runs. 886 minus 68 = 818. Sherman would have us believe (assuming all Yankees perform at their 2005 levels) that Damon will score 182 runs next year. That would shatter Babe Ruth's modern record of 177, set in 1921. ... Highly unlikely. Johnny Damon is a frustrating, annoying hitter who runs up pitch counts. If he's not No. 1 in the league in most pitches per at-bat, he's very high in the pecking order. Since his column is so full of other stats, I'm surprised Ryan didn't take the thirty seconds necessary to verify this claim. Perhaps he did -- and went ahead with it anyway. 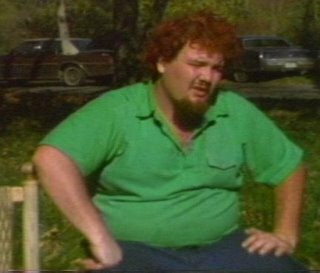 Twenty years ago today, Dennes Dale Boon, guitarist and singer for the Minutemen, was killed in an auto accident in Arizona. He was 27. Johnny Damon is a Yankee. Well, you guys could argue about this forever, and there’s plenty I could add also, but it really comes down to one thing: the Steve-Phillips-O-Meter. Steve Phillips thinks the Yanks made a great move. Also, check out Andrew's five least-favourite Red Sox. I don't know where I'd rank him, but his #4 is probably on my list, too. ... I don't dislike Damon, but to be honest, I'll miss watching Bill Mueller more. Also, someone commented today in the Mariners trade rumour thread about Bronson Arroyo, writing "Bronson is a great pitcher and has improved imensley over the past seasons he has been with the Red Sox. He will also keep improving." While Arroyo made more starts and pitched more innings in 2005, his H/9 rate has gone up, his K/9 has dropped (as has his K/BB ratio), and he's allowing more baseruners and runs. He is not improving. Fact is, Arroyo wasn't even a league-average pitcher last year. I'd rather deal him than Clement (whose 2005 ERA+ was only 96, by the way). Johnny Damon is not someone you overpay for -- and I wasn't all that comfortable with the Red Sox offer of 4/40. So it'll be weird to see him clean-shaven and in pinstripes next summer, but I'm glad it's Steinbrenner and not Henry handing him an average of $13 million a season (!) until the end of 2009. New York is paying for what Damon was, not what he will be. There can be no doubt that his four years in Boston will turn out to be far more productive than his four in the Bronx. Damon's the original Idiot, the hirsute anti-Yankee who drilled the grand slam to ice Game 7. Yankee fans hate this guy. Now they have to pretend to like him, just like they're doing with Randy Johnson. Anyone wanna guess how many times we'll see Jeter bunting Damon to second in the first inning? ... As far as outfield skills, if Torre's smart, he'll put Damon in left and Shemp in center. What it perhaps most surprising -- though it really shouldn't be -- is the profound ignorance displayed by the national media. Read Olney, Rosenthal and the CHB to see how horrible confused and doomed the (newly) cursed the Red Sox are. Their collective stupidity and inability to offer even a hint of actual analysis shouldn't surprise me, yet it does. It's like they are all 10 years old, thinking one team is better than another because it has more recognizable names on it. How do these guys have jobs? Meanwhile, here in reality: Thanks for the memories, Johnny. Now ... Jeremy Reed, come on down! My message to Red Sox fans is I tried. I tried everything in my power to try and come back, but unfortunately I know they're going to be upset, but I'm always going to have a strong feeling about them. I'm always going to remember the great times, the World Series, the three out of the four years we made the playoffs. Upset? Well, not really. In 2009, seeing Damon in the Yankee outfield and not Boston's will be a pleasant sight, not an infuriating one. (I only wish we still had Doug Mirabelli on the team, so we could cackle when he went from first to third on Damon's noodle.) And replacing his production will not be that hard. Good leadoff men are tough to find and I think the Yankees found the best leadoff hitter in the game. As Art Martone points out, Mark Loretta has a higher career on-base percentage (.365) than Damon (.353). There's no way I can go play for the Yankees, but I know they're going to come after me hard. It's definitely not the most important thing to go out there for the top dollar, which the Yankees are going to offer me. It's not what I need. Bostonian of the Year: David Ortiz. ... The Red Sox inked 37-year-old Rudy Seanez to a one-year deal with a club option for 2007. ... Tony Graffanino accepted salary arbitration. ... After nearly three months of rest and the use of a protective shoe, Pedro Martinez's right toe still hurts. "This worries me a little because generally by this time of the year I'm already throwing." So now your Boston Red Sox have no center fielder, no shortstop, and no first baseman to go along with no Theo Epstein and no clue. It's fair to say this is becoming a winter of discontent in Red Sox Nation. ... The Josh Beckett trade bought some goodwill and glad tidings, but losing Damon to the Yankees is a devastating blow to the foundation of the Nation. Bottom line: The Yankees just got better and more interesting, and the Red Sox just got worse and more boring. While a columnist has more leeway than a repoter, it's amazing how factually wrong so much of CHB's work is. They assumed there was no market for Damon? They have no 1B? What??? I have felt for years that the Yankees missed a great chance with Damon four years ago when he was leaving Oakland as a free agent. ... He was 28 and available and would have moved Derek Jeter to No. 2 in the order right there. Damon instantly makes the Yanks the AL East favorites again, with all that the Blue Jays have done and all that the Red Sox might do. As for Yankee fans carrying a grudge against Damon for helping the Red Sox climb out of a 3-0 ditch in the 2004 ALCS against the Yankees, that will vanish shortly. [T]he Red Sox have fallen squarely into turmoil. ... The Yankees, meanwhile, have no major holes. Their off-season work is all but complete, and they have done it at the expense of their rivals. Jed Hoyer and Ben Cherington were named co-general managers. Hoyer will handle the major league club's affairs, transactions and contracts, while Cherington will focus on minor league player development and scouting. Terry Francona is happy: "I know them both [Hoyer and Cherington] really well. I have worked with Jed more in the past, but as far as comfort level goes, I’m thrilled with the way things are now." The Times reported that Epstein "is expected to return to the organization", but Larry Lucchino said: "It's premature to discuss exactly what role, if any, Theo would have. All we're saying is, we'll keep a light on in the window, the door ajar, and if there's a fit, we'd like to see it happen." defies credulity to believe [Epstein] will come back with any less authority than he had when he left Oct. 31. In some ways, Epstein never has left: Both Cherington and Hoyer freely admitted yesterday they have been in regular contact with Epstein, who hasn't been afraid to weigh in on the personnel moves the club has made. One team source said that Epstein had lobbied the previous Gang of Four to explore a trade with Seattle that would send Matt Clement to the Mariners for center fielder Jeremy Reed, a possible fallback plan in case Johnny Damon doesn't re-sign. The Red Sox are also discussing a trade with Cleveland -- outfielder Coco Crisp for either Arroyo (who Cleveland would prefer) or Clement (who Boston would rather shop). ... Seattle also likes Arroyo more than Clement. 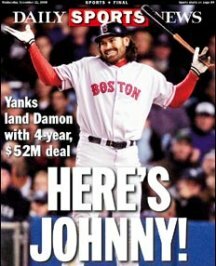 Re Johnny Damon: An "East Coast baseball official" told the Seattle Times that "last year, Boras and Boston were far apart on Varitek and they got that done. But right now it doesn't look real good. And don't forget the Yankees haven't been heard from yet. ... It's tough to see the Yanks planning to sit tight in center. Joe DiMaggio, Mickey Mantle and now Bubba Crosby?" The Newark Star-Ledger, citing "a person who has spoken to [Damon] recently", stated that Damon is wary of returning to Boston because of the turnover in the front office. Joe Torre has spoken to both Damon and Nomar. ... Yankees reliever Mike Myers would love to see Damon in New York: "I've talked to him, and he does have strong interest in playing there. ... I think he'd fit in real well in the clubhouse, even though I don't know what the clubhouse is like ..."
Baltimore is also interested in Damon. The Yankees are thinking Garciaparra could play first base. ... The Times says the Yankees "have held off on signing another utility player, Miguel Cairo, because they want to see if Garciaparra ... chooses them." Which is a painfully sad indication of how far Nomar's stock has fallen. Although Miguel Tejada said he wanted "a change of scenery," now he claims: "I never said I wanted to be traded. I said I want to see a better team." The Herald reported on Friday that Baltimore wants "at least another pitcher in addition to [Manny] Ramirez, and the Baltimore Sun reported that the Red Sox balked at giving up a hurler as well as a pitching prospect." Ken Huckaby agreed to a minor league deal. His agent said the Sox told him that if Huckaby makes the club, he'll "have to catch [Wakefield] every fifth day." Boston made a one-year offer to right-handed reliever Rudy Seanez; Atlanta, Tampa and Texas have also made offers. The ball bounces too much in the field of the shortstop, where I play. The field is not good like other stadiums. One day it's bad, the next day, it's worse ... I was uncomfortable the whole year. ... [But] the city fascinated me. I really liked it. This was my first time. I didn't know how to handle it. Nobody likes to get booed. You see me play, I always start slow. Maybe the fans didn't know anything about me. ... It's a little tough there. ... I'm not making excuses. I always say I make errors. The field doesn't make errors. Boston has dropped its suit against Doug Mientkiewicz (who has signed with the Royals) and the World Series ball dispute will go to arbitration. Both the Herald and Globe report that the Red Sox called the Orioles Friday and offered Manny Ramirez for Miguel Tejada. The source indicated the Orioles are attempting to determine just how unhappy Tejada is ... The Orioles were aware Tejada ended the season in a sour mood ... but they are also of the belief that had Renteria not been traded, Tejada wouldn't have spoken up. As of late last night, the Orioles had been contacted about Tejada by five to eight teams, including Boston, but weren't ready to take the Sox' offer to owner Peter Angelos, according to an Orioles source. It's uncertain whether Angelos would want Ramirez. The Orioles need pitching, so doing a 1-for-1 deal probably makes little sense for Baltimore. And I feel great knowing the Boston front office is smart enough not to throw in Jon Lester just to get rid of Manny and make a splash at short. The Washington Post reports that Tejada first demanded a trade last Monday in private conversations with the team. Baltimore owner Peter Angelos: "I'd find it difficult to justify a $20 million salary per year for anybody. The economics of the game don't support that type of salary for any player." After Melvin Mora said Tejada "saw the Toronto Blue Jays getting big names and saw all the teams spending money and we don't do anything", Angelos said: "We're not spending $50 million on a closer who's been a closer for only one year [BJ Ryan] and $55 million for a guy who hasn't won more than 12 games in a year [AJ Burnett]. If that's what his criticism is based on, it just shows he wouldn't be a great general manager." Senior Adviser Bill Lajoie estimated the Sox are "probably 2-3 weeks" away from finalizing its 2006 roster. The team has discussed bringing back Nomar Garciaparra, but not to play shortstop. Mike Lowell could play some first base and Andy Marte may be moved to first base or the outfield to get his bat into the lineup. Scott Boras says "I think you’re going to be surprised" where Johnny Damon ends up. Boras claims he has received "multiple offers" for Damon, including Boston's 4/40. Sources say Damon will settle for a guaranteed five-year (not seven) deal. The Red Sox are eyeing Ken Huckaby as their backup catcher. ... An Astros insider re Julio Lugo as a Red Sock: "That's a bad deal. Wait until you see him try to play shortstop under the pressure in Boston. He couldn't do it in Houston in the playoffs, and it's like that every day in Boston." The party line was that he had a bad back. The undercurrent was that he was uneasy under the bright lights of Boston. Unspoken was the worry was that his birth certificate was Renteria's 31st error of 2005, and that he was actually older than the 30 it claimed him to be. ... The Sox feared he was on the wrong side of the age mountain, a mountain on which you can only travel in one direction. New York Daily News columnist John Harper says his pick for the East (as of today) is Boston. ... Mike Myers signed a two-year, $2.4-million deal with the Yankees. ... Gordon Edes presents a good recap of the discussions last week. At the Herald, Tony Massarotti thinks the club is "aimless ... running in a million different directions at once. With their hair on fire." I don't think trying to stir up fan discontent is going to work this time. Beckett's a plus, Loretta was a steal, Marte's talent is common knowledge, and there can't be too many fans sad to see Edgar go. While the Herald reports that the team will soon announce that Ben Cherington and Jed Hoyer will be co-general managers, the Globe maintains that ownership continues to work on bringing back Theo Epstein in a consulting/advisory position. Marte, a Dominican third baseman, led the Sally league in RBI [in 2002] and was second in home runs. If his age is to be believed, he did this at the age of 18, which would make him a tremendous prospect. We have no reason to be skeptical of Marte in particular. Just a reminder that the usual caveat to Dominican ages applies. If he unexpectedly stagnates, as many of the later-exposed birthday frauds have done, that's a tip-off. There's a school of thought that the science of prospecting isn't so much about identifying strengths as it is about recognizing limitations. Reggie Abercrombie, for all the five-tool talent he has, is never going to develop the batting eye to becomes a good major league player; Bobby Jenks may never have the brain for it. With Marte, there is no much limitations, and that's why he's regarded as among the best prospects in baseball. Marte has a short swing that projects to generate a lot of power as he fills out, a precocious idea of the strike zone, and an organization that should mentor him well. Perhaps more importantly, he's able to make adjustments midstream. This season , Marte got off to a subpar start at the plate, flirting with the Mendoza line, before learning the adaptations necessary to allow him to master the level; he hit well above .300 from May 1 on. The Braves are high on him, and while an April 2005 timetable sounds aggressive, Marte has met every challenge thus far. A player with Marte's diversity of skills, and at such a young age, has so many ways to develop into a true superstar player. As a bonus, he plays for an organization [Atlanta] whose can't-miss prospects almost never, in fact, miss. Marte is as safe a bet as a prospect can be without ever playing a game in the high minors. The best prospect in baseball and a future superstar. As a 20-year-old toiling in the mostly hitter-unfriendly Southern League, Marte hit .269/.364/.525. In only 387 at-bats, he smacked 52 extra-base hits. He's got monstrous power and a broad base of hitting skills. In his prime, expect a few seasons of Adrian Beltre, circa 2004. Marte's promise can't be summed up in a single number -- his potential stems from his across-the-board skills. Maybe he doesn't do anything exceptionally well, but he does just about everything well. His .274 lifetime average isn't bad at all when you consider that he has spent almost his entire career in pitchers' parks, and his .479 slugging average is outstanding for a player who has always been among the youngest players in his league. More than any other skill, isolated power augurs very well for the player who displays it at a very young age. Marte shows unusual command of the strike zone for a young player, with 127 walks in fewer than 900 at-bats the last two seasons. His OPS has increased every year since he turned pro, even as he has faced stiffer competition each year. He was rated the best defensive third baseman in the Southern League last year. ... It helps that the most comparable player to Marte in our database is Miguel Cabrera. Maybe he doesn't have the highest upside of any player on this list, although an above-average defensive third baseman who hits .300 with 30 homers and 80 walks every year sounds like a superstar to me. But upside alone doesn't make a top prospect. There's also the little matter of how likely he is to reach his upside. ... Marte has that rare combination of high upside and low risk. No one else on this list has that. Which is why no one else is our #1 prospect. SANTO DOMINGO, Dominican Republic -- Baltimore Orioles shortstop Miguel Tejada said Thursday he's unhappy with the team's direction and wants to be traded. A source close to Tejada, who spoke on the condition of anonymity, said Tejada would like to be traded to a team on the East Coast, and specifically mentioned the Boston Red Sox as his choice destination. which has been removed from the AP story here. So, Manny for Miggy, anyone? I'm torn. Who The Hell Needs A GM? Damn! The "$" is not insignificant; it's about $11 million, which is what Boston will be paying Atlanta on ER's contract. I'm surprised someone took Rent's contract. I won't be surprised if 2005 is his worst year during the term, but if the team had any doubts about it, it's better to deal him now than after the second year. Reading the papers, it sounds like the Sox will not flip Marte -- choosing instead to sign a free agent shortstop. Hey, Pokey and Nomar are both available. As far as having three third basemen (Marte likely will be in Boston sometime in '06), I'm thinking Lowell or Youkilis will be elsewhere when pitchers and catchers report. ... Put Yook at first and get some sucker team to take Lowell. If anyone can do it, it's Boston's four-headed GM. I have [thought about signing with the Yankees]. That's a lineup people dream about. It would be one of the best lineups we've seen in a long time. ... I would cut the hair and I would stay clean-shaven. George Steinbrenner has the policy for a reason, and you have to respect that. I've never been one to challenge authority. There's no way I can go play for the Yankees, but I know they are going to come after me hard. It's definitely not the most important thing to go out there for the top dollar, which the Yankees are going to offer me. It's not what I need. I can't imagine Boston raising its four-year offer. Edgar Renteria has been traded to Atlanta for third-base prospect Andy Marte. Clearly (if you read the comments to my last post), Sean O will be happy. My question: why wouldn't Atlanta hang onto such a good prospect? The deal previously discussed included Tampa Bay, with Marte going to the Rays and Julio Lugo coming to Boston. The Sox have also discussed Aubrey Huff and/or Danys Baez with Tampa. And last night, Doug Mirabelli was traded to San Diego for 34-year-old second baseman Mark Loretta. Loretta says his former teammate Dave Roberts told him: "You have no idea what you're in for in terms of excitement." I assume another deal for a backup catcher will be forthcoming. I can't see Kelly Shoppach getting the job. ... Bill Mueller may be close to signing with the Los Angeles Dodgers. ... One possible first baseman -- Lyle Overbay -- is out of circulation, having been traded to the busy Blue Jays. Damn, we're seeing some serious changeover. The starting infield will be completely different next season. With Ramirez and Nixon being mentioned in possible deals, the outfield could be brand-new also (although not likely, in my view). Texas sent Alfonso Soriano to Washington -- so that probably kills a Manny-to-Rangers scenario -- although Seattle is still asking about Nixon. What the heck is our team going to look like next year? ... Why are they dismantling the whole team? The whole starting infield is gone. Manny will be gone. If they don't sign Johnny, he'll be gone. If they trade Trot, holy cow, the only guys left will be Varitek and I and Ortiz. In resurrecting Grady Little as the new Dodger manager, he hit a late-inning, backdoor slider out of the park. Little took a diverse group and turned them into winners who, months after he was fired, became nationally known as "the Idiots." Then, of course, they finally won the World Series. Ahhhhh, it was all thanks to Gump that we won in 2004. I see. The great Fire Joe Morgan blog has it covered. First of all, you’re not going to get fair value in any way, shape or form. This is an A-1 player, and you’re not going to get an A-1 player in return. You’re not going to get one person to make up for the (production). You might not get three or four. We're not going to replace a 1.000 OPS middle-of-the-order hitter. ... Whether it's through a lot of young players or different pieces, we believe there's a chance we could put together a deal that could set the Red Sox up for the present and the future. But now -- although Larry Lucchino has said the team has not made no effort to convince Manny to stay in Boston -- it looks unlikely that Ramirez will be elsewhere next spring. The Mets have backed off and the Angels refuse to deal Ervin Santana. There was some talk of Arizona getting involved and Troy Glaus coming to Boston -- ugh. ... One sticking point is that Ramirez would demand that his option years for 2009 and 2010 be picked up as a condition for accepting a trade. Boston is ready to offer Johnny Damon something similar to what Jason Varitek accepted last winter: 4/40. Although Scott Boras would love the Red Sox and Yankees to get into a bidding war over his client, it isn't going to happen. New York won't even bid if Damon won't consider three or four years. Boras isn't helping himself any when he says that Rafael Furcal's 3/39 deal with the Dodgers sets the bar for leadoff hitters. Are the Sox also actively shopping Edgar Renteria? The main rumor is that ER would go to Atlanta and Tampa's Julio Lugo would come to Boston. According to the Globe, Atlanta wants Boston to eat a portion of the $30 million remaining on Renteria's salary. With Lugo at second or short, Boston asked the Angels about Orlando Cabrera and have pitched a Doug Mirabelli-for-Mark Loretta deal to the Padres. Boston is talking with Oakland about David Wells; the A's are offering former Sox propsect Justin Duchscherer. ... Seattle has asked about Trot Nixon. The team has also discussed sending Nixon to Pittsburgh for either Kip Wells or Mark Redman. The Courant reports that Peter Gammons says the Red Sox nearly canceled the Josh Beckett after viewing the MRI on the pitcher's right shoulder. ... Boston spoke with Detroit about outfielder Curtis Granderson. Other possibiliies for center field are Juan Pierre, Torii Hunter, and Juan Encarnacion. The Sox also have spoken to Octavio Dotel's agent. Several MLB soucres claim that the Yankees lost as much as $85 million last year. ... And the Dodgers new manager? Grady Little. The Ball Belongs In Boston. So the Red Sox have filed suit seeking permanent possession of the 2004 World Series final out ball. An agreement reached between the team and Doug Mientkiewicz last January stated that the former first baseman would loan the ball to the Sox, but get it back at the end of 2005 "unless the ultimate issue of ownership has been otherwise resolved." Thus, the lawsuit. From our perspective, it is very important that an artifact with this much history -- it was 86 years in the making -- be part of the club archive and be available for fans to experience. Someone at SoSH claimed that the team wouldn't push this hard if it was someone like Varitek or Schilling who had gloved the ball. Perhaps. But my gut tells me either of those two guys would have given it back, if asked. I know previous World Series balls have been taken home by players (doesn't Mike Timlin have one of the Blue Jays' final outs from the early 90s?). The Red Sox World Series victory is different. More different -- and more historic -- than almost any other World Series championship in history. The ball belongs in Boston. The Post says there are five teams hoping to trade for Manny Ramirez, the most prominent being the Mets and Angels. Texas has also been mentioned, with Alfonso Soriano as the main Ranger in the proposed deal. No thank you. Listen -- I'm yelling loud and clear from my rooftop: Keep Manny! Jeff Horrigan writes that there "is support within the organization to deploy the combo of Alex Cora and rookie Dustin Pedroia at second base".